Upcoming Funding Opportunities for 2018! You are here: Home / Premium Resources / Upcoming Funding Opportunities of 2018! Upcoming Funding Opportunities of 2018! We are glad that one more year has been added in the process of assisting you in providing information about relevant opportunities and beneficial resources for the success of NGOs worldwide. 2017 has been a great year and we will keep up the good work in 2018 and coming years too. To assist you better in your fundraising success, we are willing to provide you the the most relevant opportunities and resources. As we are about to start a new year, we have compiled some important grant programs in a single guide so that you can markup your calendar in order to apply for the most important grant programs of 2018. 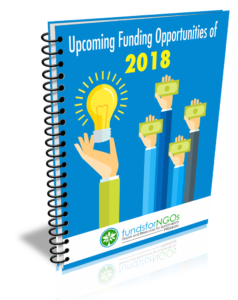 Download this resource guide on “Upcoming Funding Opportunities of 2018” available exclusively for our premium members. The guide will put a light on all important grant opportunities of 2018.